1 of 4 Heat oven to 350 degrees F. Line a rimmed baking sheet with foil; set aside. 2 of 4 For Mornay sauce, combine broth and butter over medium heat in medium-size saucepan. Whisk in Alfredo sauce mix. Bring to a boil over medium-high heat, stirring constantly. Reduce heat to medium; simmer for 2 minutes. Add 1-1/4 cups of the Swiss cheese, stirring for about 8 minutes or until melted. Remove from heat and set aside. 3 of 4 Place split English muffins on prepared baking sheet. Divide turkey among muffin bottoms. 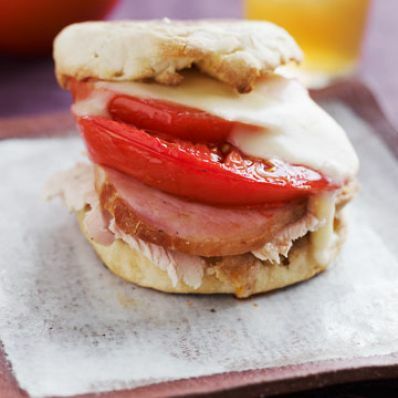 Stack with Canadian bacon and tomato slices. Top with about 1 cup of the Mornay sauce; reserve remaining sauce for another use. Sprinkle with remaining 1/2 cup Swiss cheese. 4 of 4 Bake tops and bottoms at 350 degrees F for 30 minutes until stacked bottoms are heated through, cheese is bubbly and tops are toasted. Place muffin tops on sandwiches and serve.